Outside of my love of Eunny, I also love Knitting Daily’s TV show (with Eunny!). 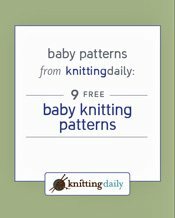 If you have seen the show and like the patterns, sign in or create an account with KnittingDaily.com and download ALL of the patterns from series #800 … FOR FREE. /squee! Travel the world on Knitting Daily TVSeries 800 with Portuguese, Armenian, Estonian, and Latvian fiber techniques. Challenge yourself with textural stitches, colorwork, and short-row knitting. Plus, on this upcoming season of Knitting Daily TV, you’ll dive into crochet edgings and trims and learn the basics for crocheting with fine yarns and threads. Each episode of Knitting Daily TVSeries 800 includes an in-depth look at knitting techniques such as pleating, I-cord basics, and bias cabling, as well as quick tips for fiber artists on duplicate stitches, mitered knitting, fringe, ruffles, and more. Learn how to care for and clean your handknits, how to measure correctly for a perfect fit, and even how to avoid yarn pilling.